The Painted Veil, set in 1920s China, starring Naomi Watts and Edward Norton, is on general release in the cinemas across UK. Based on the novel by W. Somerset Maugham, this is a love story of Dr. Walter Fane (Norton), a bacteriologist and his wife Kitty (Watts), an upper class London socialite in 1925, who went to Shanghai and then a remote, cholera-stricken village. A local newspaper Hampstead and Highgate Express reports a delegation of secondary school pupils from North London has recently visited Shanghai and Yunnan to study Chinese culture and how Chinese do recycling, in a British Council-sponsored school trip to China. Six pupils from William Ellis school of Camden, who are learning geography and Mandarin, visited schools and homes to see how Chinese live and the aspects of sustainablity. It is the second time students from William Ellis school, one of the few schools promoting Mandarin language learning in England, visited China. The language and geography students had a five-day stopover in Shanghai before visiting Yunman Nationalities Middle School in the Kunming province to look at the area’s attempts to be sustainable. William Ellis school web site. Yun Nan Nationalities High School 云南民族中学. The UK Intellectual Property Office (UK-IPO) published a new guide ‘China, an Enforcement Roadmap’ (PDF file), which offers guidance to the Chinese Intellectual Property protection and enforcement system. Aimed at businesses currently or intending to operate in China, the guide offers practical and effective help on how to protect and enforce intellectual property rights, using the current Chinese system. The iconic London Taxi also known as Black Cab will be made in China for the China and US markets. British Manufacturer Manganese Bronze signed a joined venture deal worth £53 millions with China’s Geely Group to produce 20,000 London Taxis (each will cost about 250,000 yuan/$32,000) a year from 2008 in China. A golden version of London Taxi is to be shown at the Shanghai Auto Show (words on the number plate: Classic Taxi 经典出租车). Chinese automaker Geely Group unveiled a flashy gold version of London’s black taxi cabs at the Shanghai Auto Show over the weekend, and it hopes that the iconic symbol of the British capital will strike gold when it hits the road in China and the United States. Geely inked a joint venture agreement with Britain’s Manganese Bronze in October to produce about 20,000 London cabs a year from 2008 onward. The alliance allows Manganese Bronze, which makes about 3,000 vehicles a year in the U.K., to expand sales overseas from a cheaper production base, and it has helped Geely Group upgrade its technology and product quality. BBC Radio 4 is going to broadcast a new, 10-part series ‘Chinese in Britain‘, which tells the stories of early Chinese migrants in the UK. Chinese women, education, discrimination, and images of Chinese on screen and in public. 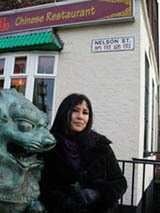 Chinese in Britain episode 1-10 will be broadcasted at 3:45-4:00pm on BBC Radio4 from Monday 30 April to Friday 4 May. Mother’s Bridge of Love, a UK charity supporting adopted Chinese children in the UK and China, is calling for runners to participate in the coming Edinburgh Marathon, raising fund for the charity. 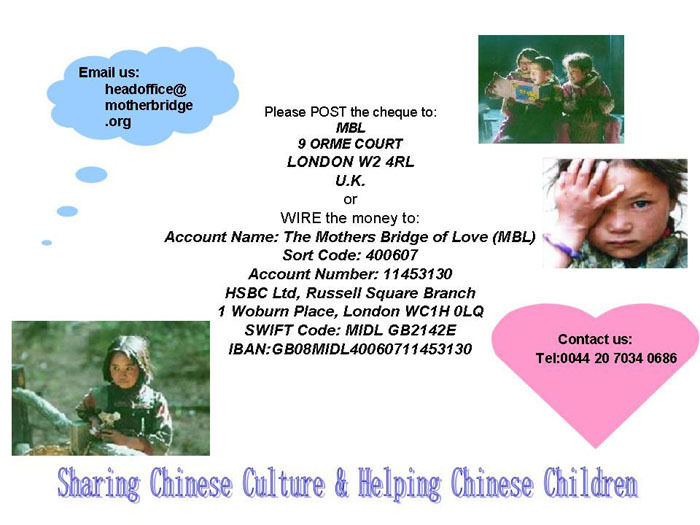 Mother’s Bridge of Love (MBL) MBL is a charity that aims to share Chinese culture and help Chinese children in China and the UK. Founded by the renowned writer Xinran (Good Women of China, Sky Burial), this charity has been providing many services for Chinese children in the UK, such as art workshops, language courses, and support and helps for the adopted Chinese children and their families. It is also raising funds for Chinese children in poor rural areas of China to better their living conditions and provide education opportunities. Interested party should contact Mother’s Bridge of Love. 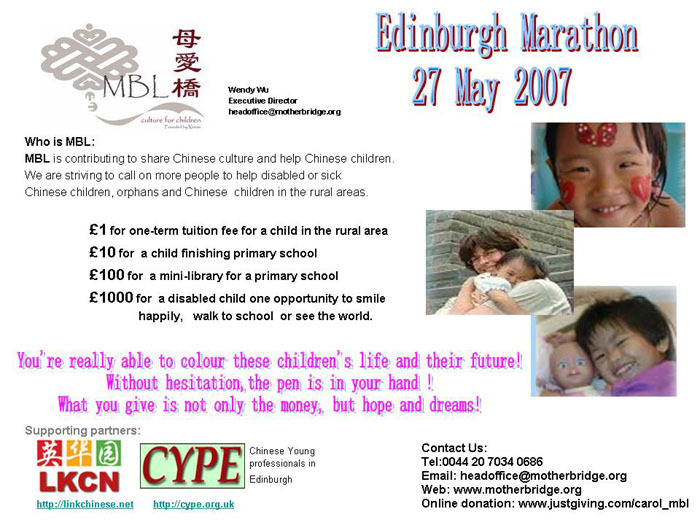 LinkChinese UK and CYPE (Chinese Young Professionals in Edinburgh) are two supporting partners of the charity run for MBL. 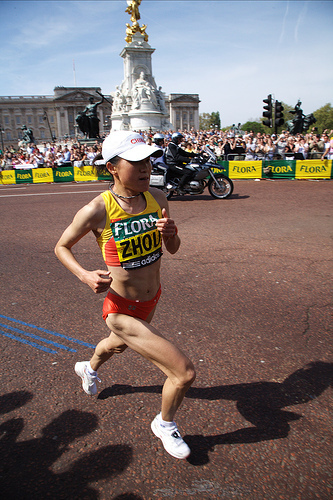 Chinese athlete, Asian Games champion Zhou Chunxiu won London Marathon in record warm temperature, becoming the first Chinese woman to win the race. In punishingly warm conditions, the 28-year-old broke away from Lornah Kiplagat and Gete Wami after 22 miles. Zhou won in a time of two hours, 21 minutes and 38 seconds with Wami second and Romanian Constantina Tomescu-Dita coming through well to finish third. 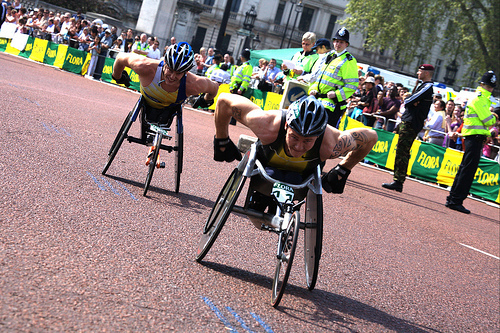 Mara Yamauchi was the leading Briton, coming sixth after running a strong second half of the race while Liz Yelling was eighth. But Kathy Butler dropped out halfway through in the difficult conditions. 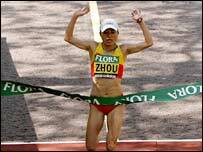 Zhou, Kiplagat and Wami had moved away from the field between 10 and 12 miles but it was the Chinese woman who was stronger over the latter stages. Chinese writer/director Guo Xiaolu’s debut English novel A Concise Chinese-English Dictionary for Lovers made the shortlist of Orange Broadband Prize for Fiction, the literature prize for female writers. Guo Xiaolu faces tough competition from other five authors whose novels also made the shortlist, among them are Anne Tyler, the 1989 Pulitzer Prize winner, and Kiran Desai, her The Inheritance of Loss has won the 2006 Man Booker Prize. The shortlist is drawn from a 20 book longlist. 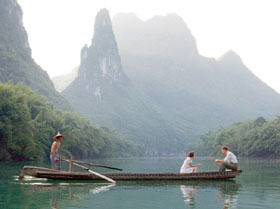 A Concise Chinese-English Dictionary for Lovers tells a story of Z, a Chinese woman comes to UK to study English, using the format of a dictionary and delibrate bad English to reflect the perspective of the protagonist (some comments). The winner will be picked by a panel chaired by the broadcaster Muriel Gary. The winner will be announced at a ceremony at the Royal Festival Hall in London on June 6. Readers can also participate in the Readers’ Award by voting online. BBC reports that new point-based system will start from 2008, according to Immigration minister Liam Byrne. In a visit to Australia, which uses similar point-based immigration system, Liam Byrne announced the timetable of implymentationof the new point-based five-tier migration system. The first tier, for Highly-skilled workers such as scientists and entrepreneurs, will be launched at the beginning of 2008. Later in the year, the tiers of Skilled workers, Low skilled workers, and Temporary workers will follow. The tier for international students will be launched at the beginning of 2009. Under the new system, international students will have to find sponsorship from government-recognised educational insitituions. Home Office’s Border & Migration Agency recently announced the launch of International Graduate Scheme (IGS), allowing non-EEA graduates to work in the UK for up to 12 months after completion of their study in the UK. With the exception of Highly-skilled workers, migrants in all working categories will have to have the sponsorship from UK employers. This, according to the government, will ensure compliance with the immigration rules.